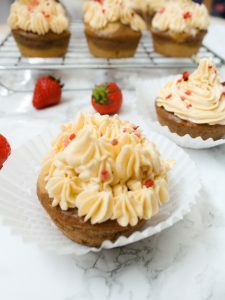 I am not a big follower of the Royal Family but I must admit that the Royal Wedding coming up this Saturday got me all excited, and so to celebrate my way I have made some Royal Wedding Vegan Sponge Cakes ! They are the perfect little sponges, very fluffy as you would expect for a sponge cake and very very … very easy! 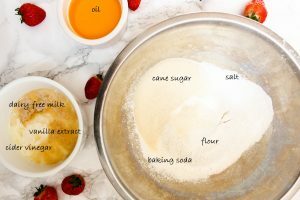 I want to emphasize the fact that these Royal Wedding Vegan Sponge Cakes are very easy to make. Vegan cakes are often perceived as being complicated, not so much in the making but mainly because of the ingredients that go into it. I understand that not everybody has in its cupboard some chia seeds, flaxseeds, xantham gum, etc. which is why I wanted to create a recipe that would not require any of that. To give my Royal Wedding Vegan Sponge Cakes a more Victoria Sponge Cake look, I have added some homemade strawberry marmelade to the batter. 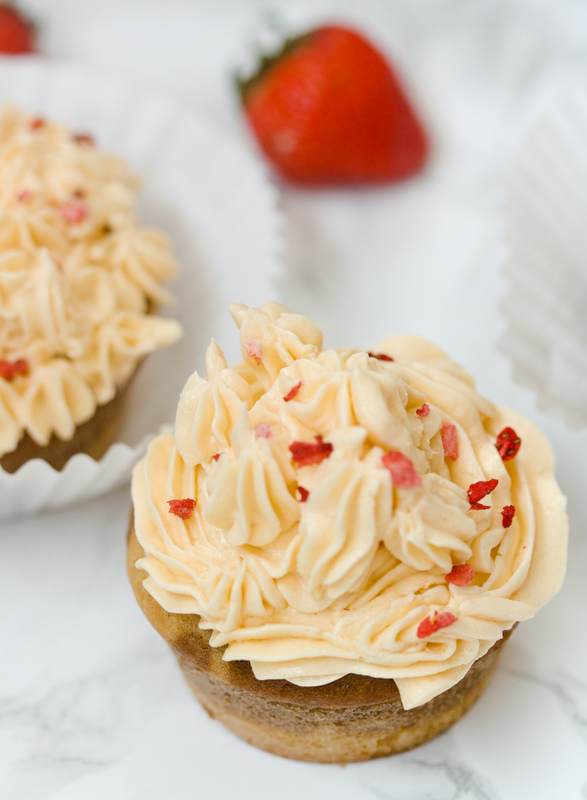 The frosting is optional, I will give you the recipe right here, right now ! Beat ( with a whisk or with an electric mixer) 180 gr of vegan butter (also called margarine) with 80 gr of powdered sugar (to do so I grind the cane sugar into my spice grinder until finely ground). This takes about 5 minutes, then I add 1 tbsp. of vanilla extract, and combine. I leave it in the fridge for at least 30 minutes. 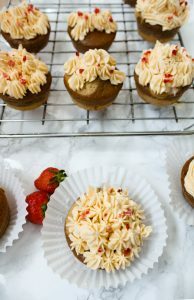 I hope you try and like these Royal Wedding Vegan Sponge Cakes, if so let me know! Share on Pinterest and tag a photo on Instagram #mimies_delicacies so that I can see your lovely creations as well as helping me reach more of you lovely people. Merci my friends! 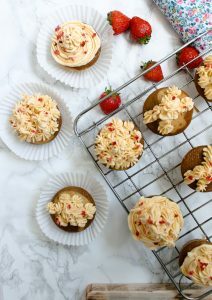 These little Vegan Sponge Cakes are the perfect fluffy treat, add some frosting to make it extra indulgent. Place the sliced strawberries into a saucepan with the orange juice on a medium heat. Let it simmer for 5 to 10 minutes and mash with a fork before removing from the heat. In a bowl mix all the wet ingredients: dairy-free milk, cider vinegar, oil, vanilla extract. In a different bowl, whisk together the dry ingredients: the flour, cane sugar, baking soda and salt. Add the strawberry marmelade into the batter. Fill each muffin tins with the batter, and bake for 25 minutes until the top turns a golden brown. Take the muffin tins out of the oven and cool on a wire rack for 10 minutes. 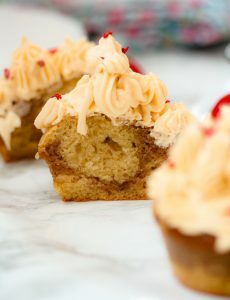 Add some frosting if desired (recipe on the article).